Jared Unzipped: Brew Spew 2015 Part 4: Shipyard Brewing Little Horror of Hops. 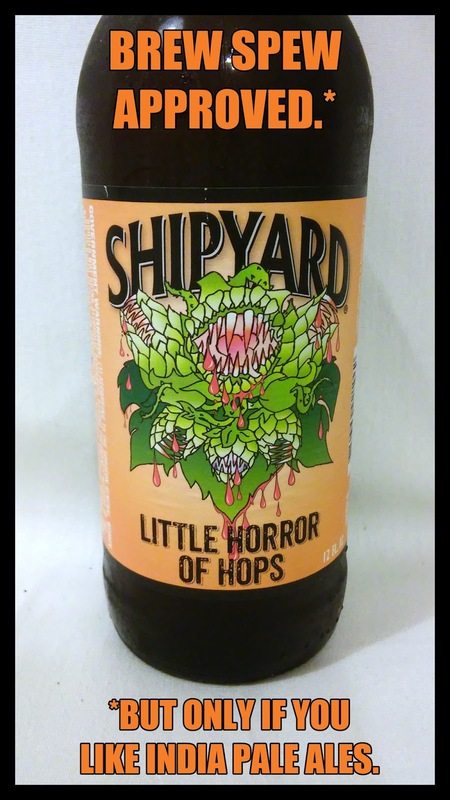 Brew Spew 2015 Part 4: Shipyard Brewing Little Horror of Hops. The fourth beer of my 2015 Brew Spew is the Little Horror of Hops from Shipyard Brewing of Portland, Maine. While I don't normally like India Pale Ales, I decided to give this one a go out of fairness. If I'm going to cover a broad range of seasonal beers for the Brew Spew, then I should at least include one IPA. So, here goes! Shipyard Brewing was founded in 1994 and was the fastest growing craft brewery in the United States by 1996. Currently, they are ranked as the 25th largest craft brewery in America. Their line of beers has won numerous national and international awards in their twenty year history. Other beers they produce include the Shipyard Blue Fin Stout and the Shipyard Export Ale, with a nearly nationwide distribution. You can probably find one of Shipyard's finely crafted beers with your local grocer or specialty beverage retailer. The Little Horror of Hops is 5.9% Alc. by volume and available annually between September and November. As with all of the beers I taste test in the Brew Spew, I will provide a real time set of notes divided into two categories. These were written as I was drinking the beer for the first time. My critique will be honest and straightforward, whether I like the beer or not. Let's begin! Deep orange color with a moderate amount of foam. The odor was fragrant and smelled like bitter, unripened fruit. An extremely bitter beer, much like biting into a grapefruit. The carbonation is almost undetectable upon the tongue. I know there's fizz in it, but I can't feel it because of the overpowering grapefruit flavor. Light-bodied and easy to swallow, thankfully. The bitterness is all on the front and sides of my tongue. Not too much bitterness upon swallowing. Surprised at how non-peppery the flavor is considering it's an IPA. The fruity taste somehow shines through the bitter nature, helping to make it more enjoyable. The bitterness has mellowed slightly. The citrus-like grapefruit flavor has also calmed down a bit. It's not so in-your-face. Has not developed any weird, funky aftertaste. Overall, it still tastes fairly similar as to when it was cold. The change in temperature hasn't altered the taste too much. As I stated previously, I do not like India Pale Ales. They're simply too bitter and unpleasant for my personal taste. That being said, if I did like IPA's, I would without a doubt enjoy Little Horror of Hops. The bitter flavor rests on the front of the tongue as you begin swallowing and not in the back of your throat. That's the key element here -- bad beers taste terrible when they're going down. The Little Horror of Hops did not have that wretched back-of-your-throat taste at all. Surprisingly, I did greatly appreciate the grapefruit quality that the beer presented. If I could find a beer that had this grapefruit essence without being so bitter, I'd probably really enjoy it! Overall, if I were an IPA fan, I'd look forward to drinking Little Horror of Hops every year. 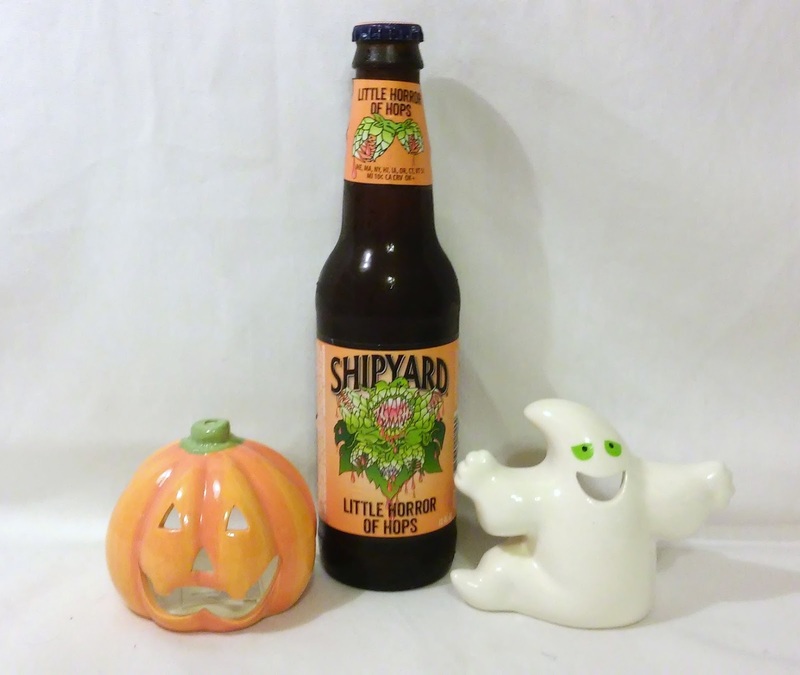 If you like IPA's, then I definitely suggest you give Shipyard's extra hoppy seasonal beverage a spin. Considering I have zero vested interest in drinking IPA's, this verdict should really be taken as genuine.